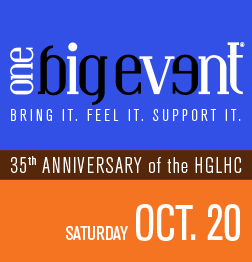 We are thrilled to announce that the Hartford Gay & Lesbian Health Collective’s 16th One Big Event will be held on Saturday, Oct. 20 from 6-11 p.m. at the Connecticut Convention Center. We have been planning and devising and dreaming up the best possible gala you will ever attend. And we hope you will attend for a wonderful occasion filled with thirst-quenching cocktails, delectable dinner, an auction so hot your credit card will be smoking, and a DJ that has been known to raise the dead for one last spin on the dance floor. Yeah, it’s gonna be that kind of party and you’re gonna want to be a part of it. So grab your besties, buy your tickets and help us make this a night to remember!